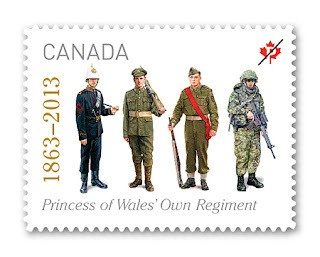 The Princess of Wales’ Own Regiment (PWOR), was formed in January 1863, from seven existing militia companies in Kingston, Ontario. It earned its name when the Regiment participated in celebrations for the marriage of His Royal Highness Edward, Prince of Wales. The name, made official in 1868, honoured the new Princess of Wales, formerly Princess Alexandra of Denmark. Since its foundation, members of the PWOR have served in every major conflict involving the Canadian Forces. In 1866, the Regiment experienced its first deployment – to the Niagara Region and then to Cornwall, Ontario – to deter Fenian attacks from the United States. In 1870, volunteers from the Regiment took part in the federal force sent to quell the rebellion in what is now Manitoba, an action they would repeat in 1885, during the Northwest Rebellion. The Regiment earned its first battle honours when, in 1899, 21 volunteers travelled to South Africa to serve in the Boer War. In 1914, the PWOR was called on again: volunteers joined the Canadian Expeditionary Force, while others filled local defensive roles including guard duty at the internment camp at Fort Henry. In Europe, members of the PWOR fought in some of the most well-known battles of the First World War. At Ypres, Passchendaele, Vimy, the Somme and Amiens, they earned individual awards for bravery as well as battle honours for the Regiment. When the Second World War began, members of the PWOR again volunteered to fight overseas. Those who stayed behind again served by guarding Fort Henry and other important local sites. In 1940, the PWOR was asked to supply five officers, 155 men, and a signals officer to the Stormont, Dundas and Glengarry Highlanders, also known as “the Glens.” In Europe, the Glens and their PWOR members participated in the D-Day invasion at Juno Beach. Even though the PWOR itself earned no battle honours during the Second World War, its participating members given the honourary distinction of the badge of the Stormont, Dundas and Glengarry Highlanders, recognizing their joint mobilization and service in Europe. After the war, PWOR members served as volunteers in a number of conflicts, including Korea, and in various peacekeeping missions and, most recently, Afghanistan. The Regiment’s crest features the motto, Nunquam Cede (Never Surrender), accompanied by the phrase Ich Dien (I Serve) and the Regiment’s initials, PWOR. The crown and feathers allude to the Regiment’s name, while the beaver represents service to Canada. 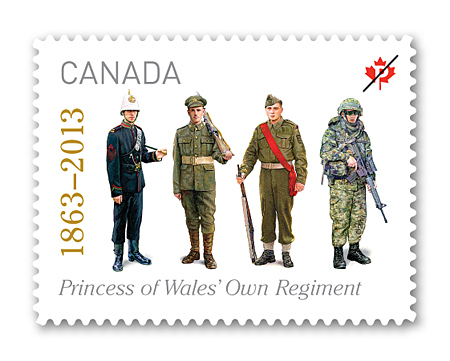 Dave Sasha of Sputnik Design, worked on the PWOR stamp along with three previous regimental stamps. For Sasha, the most important design element was the soldiers themselves. “I wanted to bring out the faces of the soldiers to humanize them,” explains Sasha. We used illustrations based on images of real soldiers to give the stamp life.” In choosing the soldiers to represent on the stamp, Sasha tackled the next challenge: representing 150 years of service. The result was a soldier from 1890, the First World War, the Second World War and the present day to show the evolution in uniform. Design: Sputnik Design Partners Inc.